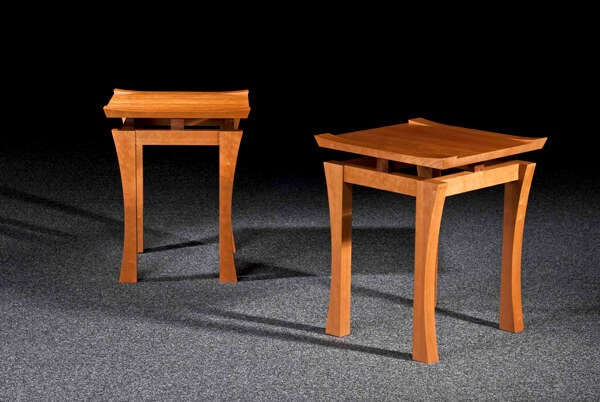 Just two pairs of our limited edition ‘Torii’ side tables left now, as we have recently sold the cherry and black walnut pair through Langton Green Gallery to a furniture collector in Kent. This was set 11, the final set in the edition of 12 pairs are in scorched and scrubbed native oak, with ripple sycamore details, they look amazing and seem the right way to end this series, for all sorts of reasons. 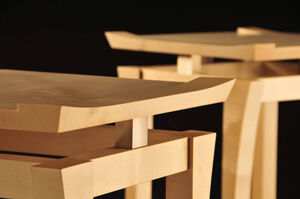 The numbers around Torii tables make sense to me; over 12 years we will have made an edition of 12 pairs. (I say ‘pairs’, but there is an exception to that rule, one client did commission a set of 3 – the only set of of 3!) The others that have been sold are in combinations of ≥… elm, black walnut, lacewood, native walnut and sycamore. One of those sycamore pairs is the only other pair available; this one is in bleached ripple sycamore with stainless steel details. They are also currently at Langton Green Gallery in Tonbridge Wells. The ‘Torii’ design has a strong emotional connection for me, a reminder of a very special trip to Japan in 1994 with a terminally ill brother. Japan and those memories have been a lasting influence ever since, and these tables are the most physical manifestation of that. Because of this connection I’ve included one of the pieces he wrote on that trip. My brother was an accomplished poet, writer, critic and cultural historian. He was hugely supportive of my early career so this almost feels like a collaborative piece of work, our joint reflections of our travels across Japan and its incredible culture. “they are waiting for your last words, master. one final moment, one last effort. leave us a poem…! is too cold for comfort, oh release me, Enlightened One! the most on which he lay absorbed it all, beyond belief. clothes, bowls and hat were fading with his breath. The limited edition ‘Torii’ tables are £1850 per pair, I’ll end up keeping a pair but can’t quite decide if it’s going to be the light sycamore or dark scorched oak. I’ll have to let fate decide and see which one goes first! 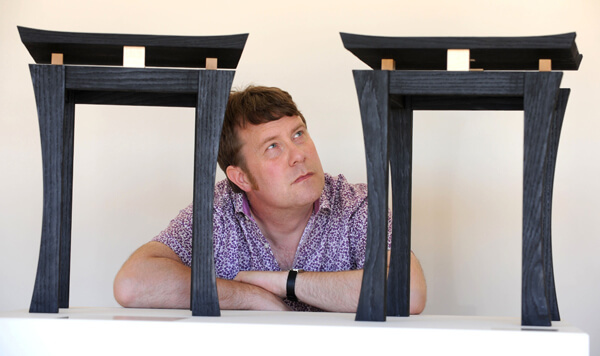 Simon with the final pair of ‘Torii’ tables made in scorched oak with sycamore details.